4035 gallon elliptical leg tank. This elliptical tank style is designed to provide the greatest capacity with the lowest center of gravity, making it the best design available for transporting larger volumes. elliptical tanks feature molded-in legs and flow-through baffles which work together to reduce sloshing and provide increased stability during transport. 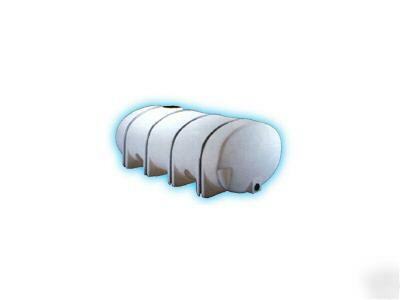 All elliptical leg tanks require full length bottom support as well as support bands. 92" wide, 77" tall, 192" long. Molded-in legs that act as "baffles" to reduce sloshing. Manufactured using resins that meet FDA specifications to ensure safe storage of potable water. We offer big discounts on truck load quantities. Have many other sizes offered, 35, 125, 225, 325, 525, 725, 1025 gallons. Call for freight quote on tanks listed below. 5 year warranty tanks are a little higher priced. E-mail us at for freight quote and tank availability.